Your heart beats with anticipation as you enter the small terminal on the island of Roatan, Bay Islands, Honduras in the Caribbean. Your eyes scan the crowd, searching for the sign with your name on it. A huge smile crosses the face of the owner of One Fish Two Fish Charters & Island Oasis. Waving in excitement, you exchange greetings. 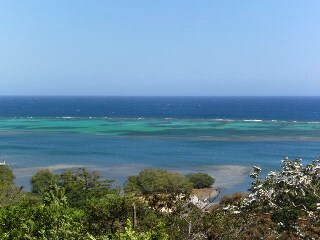 Roatan has become famous for its golden beaches, coral reefs with their exceptional diving spots, and deep-sea fishing. The island is approximately 37 miles long and 5 miles wide, and you can get around easily from anywhere on it. There are cars and scooters to rent. Buses and taxis travel most of the island, and in the West End you can take a water taxi. This visit you are moving away from the hustle and bustle of the West End to the eastern part of the island. One Fish Two Fish Charters & Island Oasis, owned by Canadians Wendy and Andrew Flood, is located in Punta Blanca, a small community of Hondurans and expats situated just past Oakridge. As you travel over the rustic road the tropical sun beating through the window radiates through your body. The gentle breeze like the coolness of expensive silk caresses your body, calming you even more. The aroma of the emerald green foliage covering the banks fills your soul. You are at peace. You venture out onto The Wahoo cabana’s eight-foot deck. Fingers of the crystal clear Caribbean Sea lap over the living coral reef. Your body tingles with the excitement of exploring this magnificent wonder, knowing that you can snorkel from right here. You can hardly wait for your scuba diving activity. 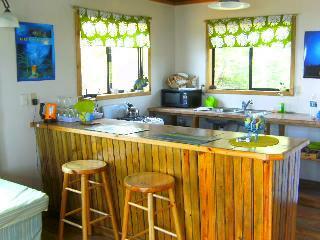 The Tropical Island Divers will pick you up right at the Punta Blanca community dock. 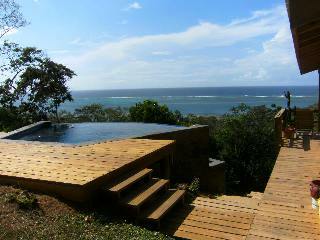 You see the lustrous wavy pattern of the gentle water lapping in the Infinity pool directly to your right. As you step into the freely flowing liquid you are immediately held in the arms of this tranquil and peaceful womblike structure. You feel totally nurtured. All is right with the world. La Paz (Spanish for peace) sits bobbing in the sea, waiting for your deep sea fishing expedition with Andrew. On board, your eyes close as you feel the gentle movement. Jiggling your fishing rod up and down you wait for that fish to bite. You are safe and with a skillful and accomplished guide. Evenings find you relaxing on the pool deck as the aroma of your succulent lobster fills the air from the BBQ. The week flies by and as you board your plane to fly back home you know that you will return, perhaps bringing friends. They could rent The Grouper as Wendy and Andrew have two cottages for rent. The cottages are for rent on a daily, weekly, or monthly basis.